Last January, I was told about a mother and daughter kitty that were outside a home with no shelter during the polar flux. The temperature was minus 40 degrees with wind chill, and after posting for rescue help with no response, I was able to convince a trapper who lived over an hour away to come help trap and vet this family. I thought it would be a trap/spay/release for the mom and to have my vet see if the daughter could be socialized and then possibly adopted/fostered. When the trapper and I arrived at the home, we saw two extremely sick and neglected "frozen" cats, and owners that had no interest in helping. In their own words, they have always hated "that cat" and her babies "always" died in the garage anyways (that is why they would not let the cats in the garage). They would not put a shelter out for the cats and already had a cat inside, so they wouldn't bring them in. When I asked how long they had had this cat that kept having babies, I was told they got her as a kitten; she is purebred and it has been over 10 years. Ten years of litter after litter, watching her babies die. My heart broke. Even after seeing this mom and daughter sick, freezing and suffering, it took us awhile to convince the owners to allow us to take the cats to the vet. They didn't want to give the baby up because she wasn't "that" sick. However, the husband got very angry and again showed us how much he hated "that cat" and said we could take them both - and they were not allowed back. We got them both to my amazing vet but sadly the daughter was so ill, from being sick over and over again, that her throat had closed and she couldn't even swallow food. We named her Winnie and she did not survive, but I can tell you we were able to pet her and I sang to her when her mother was being examined. The mother cat we named Hermione (after the "Harry Potter" movies and a special rescue kitty named Herman who was dumped at a kill shelter as a senior). Hermione was very sick and survived being spayed, but now what? The only home she had ever knew was denied her. Her last surviving baby had died and she was abused/feral. She had a few teeth left but was not an "adoptable" cat. Well, I brought her home to die, if she needed, or live, but I promised Hermione she would be warm, have a full belly and know what a normal kitty home is like - with humans that cared. I chronicled her progress because I thought people needed to see what this poor innocent creature had suffered at the hands of her owners. I asked the OSPCA to investigate, but was advised that even though I: videotaped the cats at their owners' house and the owners saying "good-bye" to them; had witnesses who talked, and saw the cats at the owners' house; and had my vet's secretary information, as the owners had called the office and had tried for over half an hour to get information on "their cats," that because I did not get, in writing, a release that the owners had signed saying these were their cats, that no charges could be laid. If anything, I want people to read this story and learn from this, and try to get something in writing if rescuing or doing a TNR. I could have brought a piece of paper and told the owners my vet would not help if I did not get a release saying I had custody of the cats, but I thought video tape and witnesses (the trapper and the person who told me about the cats originally) would be enough - but it wasn't. 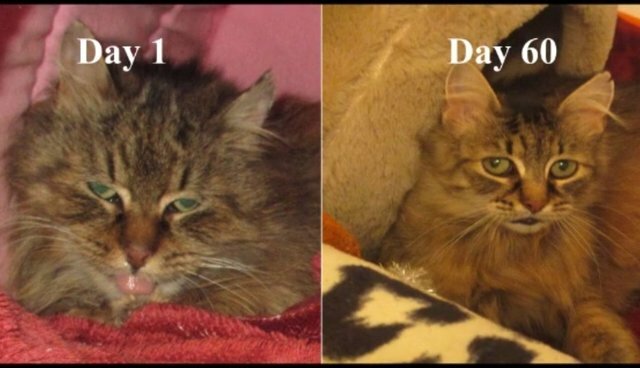 Please take a moment and watch how Hermione, the ex-frozen cat has transformed. How this hurt, abused creature survived frostbite, the death of her children and a very bad cold. She is available for adoption as a very special needs kitty through Urban Cat Relief in Toronto, Ontario, Canada. Please read her bio here. Watch videos of Hermione playing and singing to her after recovering from frostbite. Check out pictures of her transformation including a crazy before-and-after picture.